Oh baby it is cold outside. This season the northeast has experienced bitter cold weather and it appears that these bone chilling temperatures are here to stay. A remedy to beat the winter blues is to snuggle up by the fire and warm up with some comfort food. There is nothing more comforting that a slow cooked, hearty stew with beans, meats, veggies and aromatic herbs. Cassoulet is the perfect way to warm yourself up on the inside. Pair it with some wine from Languedoc-Rousillon and you are in for a heartwarming treat. Cassoulet is a an iconic French dish that dates back to the Middle Ages. There is much room for debate as to the origins of cassoulet, but it is most widely known to have come from southwest France in the Languedoc region, specifically from the town of Toulouse. Like many interpretations of its origins, there are many versions of cassoulet, and recipes vary from town to town. Cassoulet traditionally is cooked on low heat and simmered in a cassole(clay pot), hence the name cassoulet. The dish is typically made with rich meats such as duck, lamb, or pork. The obvious wine pairing for cassoulet are the wines from Languedoc. Join me and my fellow French Winophile wine writers on Saturday January 20th at 11am EST as we explore the wines and cuisine of Languedoc. 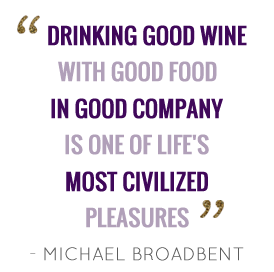 Use #Winophiles to join in on the Twitter conversations. With a glass of wine from Languedoc transport yourself to the sunny beaches of southern France with its beautiful forested hills, century old castles and rows of vineyards across its landscape. The appellation gets its name from the picturesque village of Minerve, just north of Corbières. The first vines in the region were planted by the Romans. The town Minerve was named after the Greek Goddess Minerva. The region has deep history with century old castles, local caves and cave paintings estimated to be 30,000 years old. Minervois is the largest wine-producing AOC in Languedoc. It is a rich appellation with diverse terroir driven wines. They predominately produce red wines from Syrah, Grenache, Carignan, Cinsault and Mouvedre. The AOC requires that Grenache, Syrah and Mouvedre must make up 60% of the blend. The wines of the region are full-bodied, structured and elegant. The wines of Minervois are thought to be more richer in fruit and softer in tannins than the wines of Corbières. In the 17th century two brothers from Massiac in the Auvergne region settled this spot, but during the French revolution the Chateau was burned to the ground. More recently Bernard Bourdouresques and his family revived the Domaine and planted vineyards. In 2012 the vineyards were certified organic. The Domaine is extreme south of Massif Central on gently sloping hills that lead out to the Mediterranean coast in the near distance. The soil is limestone and clay. The wine is a blend of Syrah, Grenache and Mouvedre. The crimson color is alluring. The wine has notes of juniper, rosemary, berries, black pepper, and garrigue. It is medium bodied and well-balanced. This is an example of a Minervois that has the potential to age. Corbières is located at the foothills of the Pyranees and was granted AOC status in 1985. A unique region with varied geology, soils and microclimates. Winemaking in this region dates back to 11th century BC. The predominant grape is Carignan though Syrah, Grenache, and Mouvedre are increasing in recent years. The climate is Mediterranean with dry hot sunny days and cool nights. With the many valleys in the region, there is a wide diurnal range. Red wine blends dominate the region with a small production of white wines made from Bourboulane, Maccabeo, and Grenache Blanc. Fabienne & Bruno Schenck planted vines in 1995 alongside some very old vines, boasting some 100-year-old vines of Carignan. The domaine has been farming organically since 2012. The wine is 45% Carignan, 35% Grenache, and 20% Syrah. The wine is quite aromatic on the nose with berries, cassis and vanilla. There is freshness on the palate with notes of plum, raspberry, pepper, graphite. There is a strong flinty earthy profile to the wine. This Corbières is elegant with roundness on the palate. The wine is medium bodied, with nice acidity and grippy tannins. The wine will drink well for 4 to 6 years. A wonderful value for the wine. My first tasting of cassoulet was very recent when I dined at Michael Whites’s restaurant Vaucluse in New York City. Michael White is a highly acclaimed chef who owns the Altamarea Group of restaurants(Vaucluse, Ai Fiori, Osteria Morini, and Butterfly to name just a few). At Vaucluse, I immediately fell head over heals in love with his decadent preparation of cassoulet. I scoured the internet to see if Michael White had an online recipe for his famous dish. Sure enough he did have a cassoulet recipe, except this one was prepared with chicken. With all the holiday indulgence, a healthier chicken cassoulet was just what I needed. I followed his recipe pretty closely, just substituted boneless chicken thighs(skins removed) and decided to eliminate the bacon(I mean if I was sticking to a healthier version then the bacon had to go too). The recipe is fairly straight forward and very easy to make. If it is your first time making cassoulet, I highly recommend Michael White’s recipe. The key to the recipe is the sofrito, make sure to prepare it ahead of time to allow the ingredients to develop and marinate. What makes cassoulet so special is the slow simmer, allow time for this very important process. Michael White’s cassoulet recipe is mouth-wateringly delish. It was amazing. It tasted even more spectacular the next day. The whole family enjoyed the aromatics throughout the house while the cassoulet was slowly simmering. Click on the link here for Michael White’s chicken cassoulet recipe. Pair the cassoulet with wines from Minervois and Corbières. The two wines paired wonderfully with the cassoulet. As the wines were medium bodied, it was perfect with the chicken version. The tannins were just right in the wines to pair with a lighter version of cassoulet. It was sheer perfection. The French Winophiles are excited to share their Languedoc wine and food pairings with you. Below are links to their articles. Welcome to Winophiles Rupal. Great article, I know that you are going to be a welcome addition to this group. Welcome to the French Winophiles, so happy to have you join the group! I am amazed at all the different variations of cassoulet. I appreciate your healthier version with chicken. I look forward to reading more of your blog, cheers! Thanks Jane. It’s been so much fun. Looking forward to next month. So glad you’ve joined us this month! Your recipe sounds delicious and offers a lighter version of cassoulet – I love that it’s made with chicken. Great photos! As Syrah Queen this is a great introduction for you into our #Winophiles group. The cassoulet with chicken sounds like a delicious and lighter alternative. Thanks for sharing! So I didn’t make cassoulet (didn’t do a pairing for this story) and now I’m thinking we could eat a new version each dinner for a fortnight with the Winophiles roundup! Thanks for this post – so inspiring! A great post Rupal! Love that you made a chicken cassoulet too! I’m definitely going to have to try that version! Hope you get a break from the cold soon! Nice overview of the region Rupal, always appreciate a good review. And the sofrito tip, I’ve tucked that away, hoping to make Cassoulet soon. I’ll bet there will be plenty of cooler winter days left to enjoy this dish and a Languedoc wine! The cassoulet really does seem like the perfect way to keep cozy. And I do love Michael White’s food – always fantastic! Beautiful prep shots too.